Pressure blowers and high temperature industrial process and OEM fans and ventilators sales. Supply of OEM and industrial process pressure blowers, fans and ventilators; wall and roof exhaust fan ventilators, super high pressure large pressure blowers and special OEM large fans. industrial; process and commercial heating; ventilating and air conditioning equipment. Oleg Blower Corporation is one of the North America's leaders in providing air movement equipments - fans, blowers, ventilators. We have established long-standing relationships with many of the industry leading companies. 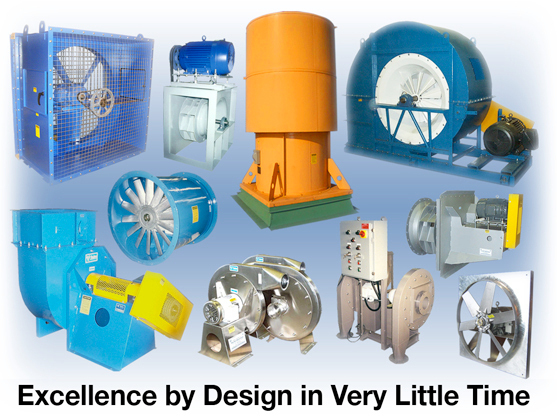 Our goal is to deliver highest quality fan / blower products and superb service support to our customers. This insures the highest level of our industrial process and OEM customer's satisfaction. We are committed in providing excellent services to our customers, from quotation to the equipment installation and its service. Today our production is growing, as more and more satisfied customers come back to us. Our commitment to quality service has ensured that we now receive orders from a wide spectrum of industries. AMX Mixed Flow Fan combines the benefits of axial flow and centrifugal flow fans. The Canada Blower AMX ventilator has the advantage of a compact design and straight-through airflow as well as the preferred acoustic characteristics and high pressure ventilation capability ventilating.com fanblower.com highpressureblower.net industrialblowerfan.com industrialfanblower.net industrialfanblower.com pressureblower.net northernindustrialsupplycompany.com industrialpressureblower.com tenderall.com chicagoblowercanada.com cbblower.com buffaloblower.com buffalofan.com nis-co.com canadianblower.com olegsystems.com canadablower.com abbblower.com acmefan.net industrialblower.net fansandblowers.net americanblower.net barryfan.com cincinnatifan.net canadafans.com barryfan.net pennbarry.net pennfan.net tcffan.com. Canada Blower Mixed flow fans are a popular choice on many air supply, return, and exhaust air applications in the HVAC industry for both constant and variable air volume fan systems. The efficiency and sound characteristics of Canada Blower mixed flow fans are often desired in buildings such as hospitals, libraries, theaters, and general offices. The heavy-duty construction of AMX fans also make them suitable for many industrial ventilation applications handling ambient air.